InfiniTV 6 ETH is the world's most advanced network tuner for cable TV on the PC and a must-have accessory for Windows Media Center. It connects to your home network and lets you watch and record up to six live channels of HDTV on PCs throughout your home! Don't settle for only being able to record two or three shows at once. Restore family harmony and never argue again over whose show should be recorded! InfiniTV 6 ETH works with Windows Media Center to turn virtually any style of PC into the ultimate cable box and DVR! It supports all cable TV channels, including premium channels like HBO®, Showtime® and Starz®. When your PC is paired with a Ceton Echo media center extender or Xbox® 360, you can also watch TV and DVR on any TV set. Replace all your cable boxes and DVRs -- and get rid of those expensive monthly fees -- and enjoy your favorite shows in any room, all from a single cable connection and using a single CableCARD™. 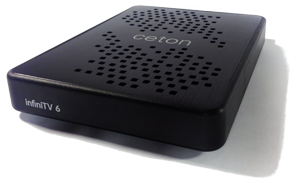 With a Ceton InfiniTV your PC becomes that nirvana entertainment box you've always wanted. Have all your media -- TV, DVR, music, photos, videos and Internet media services -- available from one awesome device. InfiniTV 6 ETH supports CableCARD and connects to any U.S. cable system to receive all SD and HD digital cable channels without needing a set-top box. As cable providers move to Switched Digital Video (SDV) technology, rest assured that your Ceton InfiniTV 6 ETH supports SDV Tuning Adapters just fine. * Note: assigning tuners between different PCs is a supported feature while dynamic tuner pooling between multiple PCs is currently a beta feature.